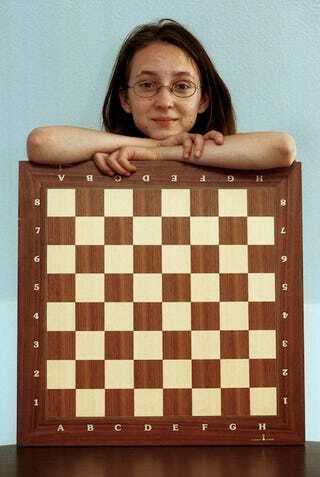 German schoolgirl Elisabeth Paehtz, 14 years old, leans with crossed arms on a chessboard in Kerspleben near Erfurt, eastern Germany, Tuesday, June 22, 1999. She is ranking eighth in the world championship for young players and is a member of the women's German National Chess Team. Elisabeth Paehtz is one of five young chess experts, who will suggest possible moves and tactics for an world team against World chess champion Garry Kasparov. Kasparov, who lost a tournament two years ago to a computer, nowis taking on the Internet. Kasparov has signed a deal with Microsoft to play a match this summer against a "world team" made up of anyone who comes to a Microsoft Internet site and votes for suggested moves against the Russian grandmaster. The match is played in the "Gaming Zone" of Microsoft's MSN network of Internet services and started June 21, 1999. Kasparov will make the opening move, and visitors to the site will be given 24 hours to vote for a countermove.